new height, writes Bryn Youds. The popularity of Susie Cooper ceramics stems from its diversity across eight decades and its supreme quality. In Susie Cooper design there is surely something for everyone. Her work encompasses an array of styles from jazz deco to definitive polka dot simplicity, from quirky nursery wares to impossibly graceful china. Cup and saucer £ 15-20. Susie began work at A E Gray and Co in 1922 aged 19; very quickly she established herself as a leading ceramic designer and at the same time revolutionised output at Gray's . Classics of art deco in swirling lustre designs and vibrant colours won Grays a silver medal at the Paris exhibition in 1925. Later in the twenties Susie introduced bold abstract designs. Cubist and Moon and Mountains remain favourites today (small jugs in good condition £ 150+). The development of banding as a complete design in itself was her greatest achievement at Gray's and one which was profoundly influential on the pottery industry. Susie wanted to have complete control over production, including design of the pottery shapes themselves. So in 1929, showing remarkable courage, she set up in business on her own. Susie always knew she would succeed and the bold and distinctive designs from her first few years certainly reflect that confidence. In 1931 Susie Cooper moved to her new factory, Crown Works. The event was celebrated with a new backstamp in the form of her famous leaping deer. Soon after, she launched the first of her much acclaimed pottery shapes. The Kestrel range was an instant success and has become an icon of modern design. It encapsulates her ethos of 'elegance with utility'. Susie composed modernist sculptural forms to provide supremely functional wares - pots pour perfectly and tureens stack neatly, their lids double as dishes. Kestrel wares now command high prices, with good condition tea and coffee pots having a current price of upwards of £ 100. The lid locking flange Susie incorporated into the Kestrel design tends to mean that relatively few survive today without the damage caused by years of impatient rattling at the lids to remove them! 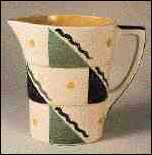 Stepped jug in design E314, c1931. Rare and desirable, around £ 300. Susie was a great experimenter, always wanting to develop ideas. This resulted in her internationally popular wash banding, underglaze crayon designs and the transformation of lithographic transfer printing. Design brilliance rapidly won her massive sales at home, lucrative export markets and both critical and public acclaim. Susie Cooper lithograph printed designs are particularly sought after in Japan. It is perhaps their restraint, exquisite quality and attention to detail that makes them so prized. A trio in Dresden Spray, Patricia Rose or another of her floral lithographs commands around £ 100. Susie Cooper China was established in 1950 with Susie purchasing her own manufacturing business. Working in the new medium inspired her. Perhaps of particular interest are early china designs in vibrant post war colours applied to the graceful Quail shape which appeared in 1951. It is believed by many that Susie Cooper's 1960's china patterns on the acclaimed Can shape are amongst the finest in the world. The Can shape was just one of the prized assets acquired by Wedgwood when the Susie Cooper companies were bought by them as part of the Tuscan group in 1966. Prices for bone china are just starting to rise so collectors would be well advised to acquire examples as soon as possible. 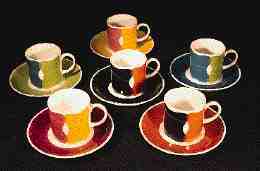 Good examples of bone china can still be bought for under £ 20 for a cup and saucer. A great deal of Susie Cooper china is still in active service, thus preventing it, for the time being at least, from being the same valuable commodity as the rest of her output. 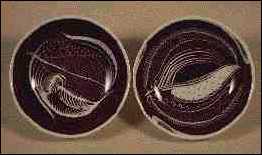 Two experimental bone china bowls decorated by Susie Cooper, dated 1953. Susie Cooper struggled for years with her working conditions at Wedgwood, frustrated by her loss of control over production. Her frenetic work at Adams in the 1980's as well as increasing acclaim, provided some consolation. Susie eventually retired to the Isle of Man in 1986, where she set about creating her remarkable 'seed paintings'. Her passion for her work continued right up to her death at the age of 92 in July 1995. The influence she exerted on design in the 20th century is assured for the 21st century and beyond. The future looks bright for collectors of Susie Cooper pottery. Prices mentioned here are crucially dependent on condition and design. An accurate guide to value can be obtained from reputable auction houses and well established dealers. One of the main problems for a collector is dealers who are new to selling Susie Cooper ceramics. With little idea as to the true value of their stock they often over price. Occasionally, however, for someone with a knowledge of her work, a rare item can be still had at a low price. It must also be noted that prices have been rising consistently for some time, making valuations problematic. Bryn Youds is author of 'Susie Cooper - An Elegant Affair'. Lavishly illustrated, large format. Thames and Hudson.